This Low-Carb Italian Sausage Soup with Tomatoes and Zucchini Noodles rocked my world and during January I like to remind readers of some of my low-carb favorites! This tasty soup is also gluten-free, low-glycemic, and can easily be Keto, Paleo, or Whole 30 with the right ingredient choices. Use the Diet-Type Index to find more recipes like this one. Click to PIN Low-Carb Italian Sausage Soup with Tomatoes and Zucchini Noodles! If you enter Italian Sausage Soup into the search bar on Kalyn’s Kitchen, it’s pretty easy to see that spicy or mild turkey Italian sausage is one of my favorite ingredients to use for soup. And truthfully, I’ve loved all the Italian Sausage soups I’ve posted on the blog, but this Italian Sausage Soup with Tomatoes and Zucchini Noodles rocked my world in a special way because of the short bits of zucchini noodles in the soup. Of course using zucchini noodles instead of pasta or beans in a soup like this also makes it a perfect low-carb and gluten-free recipe, and if you omit the optional grated Parmesan, this soup is also Paleo. You could easily make this recipe Keto as well by using only one can of tomatoes and using full-fat pork sausage. But no matter what kind of diet you choose, I hope you’ll try this Low-Carb Italian Sausage Soup with Tomatoes and Zucchini Noodles just because it’s a really, really delicious soup, and soup like this is a very good reason to keep making zucchini noodles all winter. And if you like that idea, check out this collection of The BEST Low-Carb Zucchini Noodle Soups! Squeeze the turkey sausage out of the casings and brown it well. Add the browned sausage, chicken stock, canned petite dice tomatoes, tomato paste, and spices to the soup pot and start to simmer. Chop up the red pepper, green pepper, and onion and saute for a few minutes; then add the vegetables to the soup and simmer on low for 30-60 minutes. 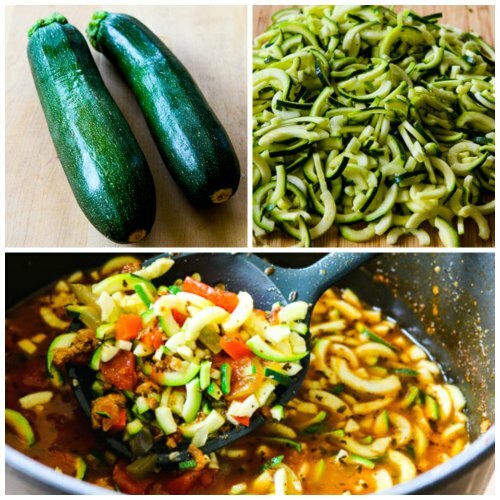 After the soup has simmered for a while, use a Spiralizer (or other method for making zucchini noodles of your choice). (I used my Paderno Spiralizer and cut a slit along zucchini and used the thick blade to make short curved noodles that slightly resemble macaroni.) Add noodles to the soup and simmer on low for 20-30 minutes more. Serve Low-Carb Italian Sausage Soup with Tomatoes and Zucchini Noodles hot, with a little freshly grated Parmesan to sprinkle on top if desired! When the sausage is nicely browned, add it to a medium-sized soup pot with the chicken stock, canned tomatoes and juice, tomato paste, dried basil, dried oregano, and ground fennel. Let the mixture start to simmer over low heat. While soup simmers, chop up the red bell pepper, green bell pepper, and onion. Heat the other teaspoon of olive oil in the same pan you browned the sausage in and cook the peppers and onions for a few minutes, then add to soup pot. Add noodles to the soup and simmer 20-30 minutes more, depending on how done you like the zucchini. Season to taste with salt and fresh-ground black pepper and serve hot, with freshly-grated Parmesan to add at the table if desired. This recipe created by Kalyn and Jake, with inspiration from Italian Sausage, Zucchini, and Macaroni Soup. 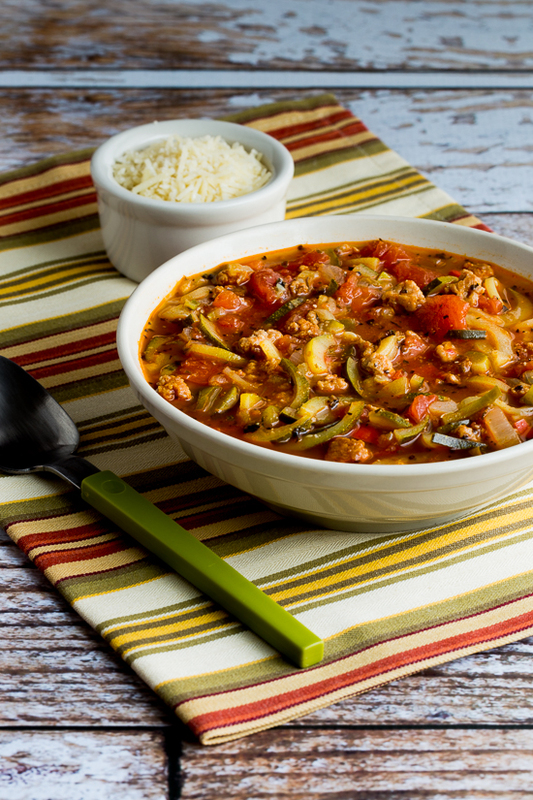 This Low-Carb Italian Sausage Soup with Tomatoes and Zucchini Noodles is perfect for any phase of the South Beach Diet and most other types of low-carb and low-glycemic diet plans. South Beach would prefer turkey Italian sausage like I used, but other diet plans would allow pork sausage. If you omit the cheese and use approved sausage, this soup will be Paleo. I am using the nutritional analyzer, wonder what you would say serving size is? 1 cup? my husband and i like the one like this with noodles but I am doing low carb so this is perfect! we really liked it! I’d say a serving is closer to two cups, maybe somewhere between 1 1/2 and 2. When I estimate the amounts in cups of the ingredient list I get about 15 cups. Another winner! Didn’t have zucchini so we used cubed cabbage, celery & carrot. Delicious! That sounds good to me; glad you enjoyed it! This is one of our favorites. I usually add mushrooms too. We are trying to do low carb so it satisfies our craving for goulash! This soup was wonderful my husband and I really loved it. The only thing I did different was use tomato sauce instead of paste and added the meat of a whole chicken to it. We froze individual containers so we could take them to lunch and they heat up great. This made over 8 servings and is awesome for meal prep. We will make this again for sure! * except for the zucchini. I forgot to mention that I just plopped the spiralized zucchini into the boiling soup after the 10 min cook time and let it sit for a few min until it was softer. I didn’t want the zucchini to get mushy. Fun to hear how that worked for you! You’re smart not to cook the zucchini in the Instant Pot! I loved all of the flavors in this soup SO MUCH!! Thank you for sharing with us! There was only one problem. My bone broth took so long to make that I was forced to make this in my Instapot because I ran out of time. And it worked perfectly! So I followed all ingredients the same — I just cooked the sausage, and I sautéed the onions and peppers with the meat, during the last few minutes. Then I added all the tomatoes, broth, and seasoning, set my instapot to soup on low for 10 minutes, and it was seriously amazing! Thanks again! My husband and I maintain a ketogenic diet… Do you think this would be good with about 1/2 cup of heavy whipping cream thrown in? I can’t see why that wouldn’t be good. Or put plenty of grated Parmesan in the soup! So glad you liked it! And I am always happy when people individualize the recipes to their own taste! So glad you liked it! Love those colorful peppers! Thanks Dennis; so glad you're enjoying the recipes. I still print them myself all the time! 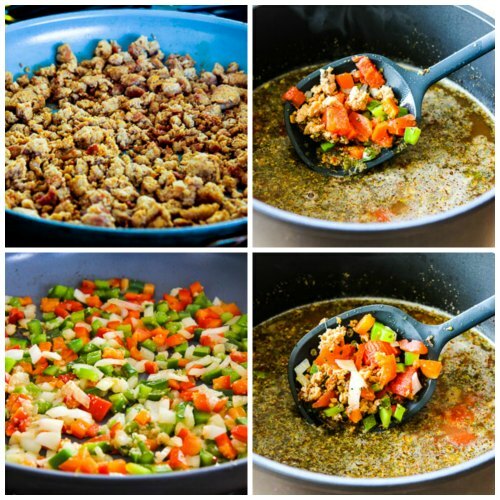 Kalyn…Thanks again for another great low carb dish. I really love your recipes and have filled up a note book with your goodies! One thing that makes your website great is that you provide a real easy way to print your recipes. Other sites have not woken up yet. Most people don't have a computer next to their stove or kitchen. Keep up the good work! Dennis in Fla.
What a great way to incorporate zucchini noodles! I'm so happy that it's soup season now. Making soup is one of my favorite weekend activities. Lydia, me too, and I'm already thinking of more soup ideas with zucchini noodles. How well does this soup keep if some is leftover? Do the noodles get too soggy? If so, perhaps I can portion out what is needed for a meal and add the noodles to it. I use zucchini noodles to so many dishes… I keep them in the fridge and use as a base for recipes using pasta or rice. I often zap a portion for 15-30 seconds, add a small amount of pasta/rice on top, then add main course. Beth, the zucchini is pretty well-cooked in this soup and I didn't notice any problem in reheating it both after it had been in the fridge for a few days and after it had been frozen. I haven't tried microwaving zucchini noodles, will have to try that!